This year, the Council for the Arts in Jacksonville, NC, offers its 10th Annual Soup in a Bowl, scheduled for Saturday, Mar. 10, 2012, from 11:30am – 1:30pm at the Council for the Arts at 826 New Bridge Street in Jacksonville. Ten dollars buys a one-of-a-kind bowl designed by potters, such as: Ben Watford, Kathleen Lenn and Nancy Newman and reserves your place at the table. For the best selection, stop in early for your special bowl! We are already compiling a list of home made soups. We usually have more than twenty different selections; everyone finds a “must have” recipe. There are always quite a few gourmet selections, courtesy of the many talented chefs who donate their inventive creations. It is the creativity of all the participants that makes this event so superior. Last year we had twenty five soups and eight different breads and cookies. Try as many as you wish. Musical entertainment will be provided. Check out our web site at (www.jaxarts.com) and click on the soup link to see current soups. Enjoy delicious soups, breads, entertainment and, of course, super company. Call 910/455-9840 for more information. Seagrove, NC……And someone said that making a tile is as close to a painting as a potter can get – how wrong they were! The NC Pottery Center presents “The Potter’s Palette”, featuring over 80 12” x 12” canvases done by prominent NC clay artists. Clay artists from around the state were invited to produce a canvas using any medium they desired to present a different expression of themselves and their talent, to be sold in a fundraiser to benefit the North Carolina Pottery Center. The results are impressive and are currently on display at the Center in Seagrove. 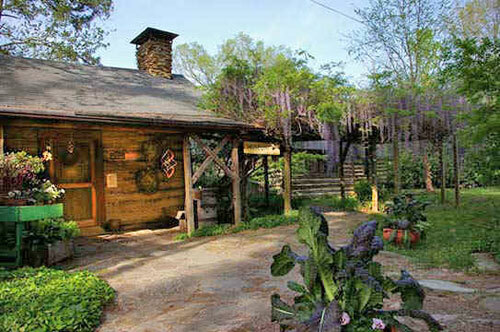 This rare and unique fundraiser is the first of its kind at the NC Pottery Center. On Feb. 4, 2012, the public will have the opportunity to bid on these palettes and the opportunity to own a canvas created in a medium not used everyday by these outstanding artists. 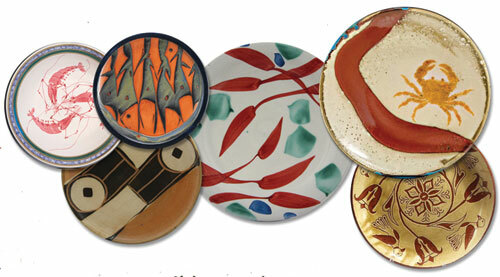 Truly a one-of-a-kind piece to complement any pottery collection! Many of the artists will be featured guests, and there will be several clay creations to complement the canvases available to purchase as well, making it really a one of a kind purchase. The canvases are posted on the NC Pottery Center’s website (www.ncpotterycenter.org) and absentee bidding will soon be offered until Feb. 1, 2012, at 4pm, for those who can not attend this special event. The fun and festive event begins at 4pm on Feb. 4, 2012, with live musical entertainment and a delectable buffet featuring an array of delicious hors d’oeuvres from gourmet bites to seafood and cheeses to desserts and much more. Join us for this wonderful spread and a selection of beverages while you preview the collection and register to bid. The exciting auction starts at 5pm. Participating clay artists include: Rita Abee, Colleen Black Semelka, John Britt, Tammy Leigh Brooks, Jeff Brown, Michele Hastings, Bonnie Burns, Kim Ellington, Mary Farrell, Alexa Modderno, Michelle Flowers, Becca Floyd, Mary Paul and John Garland, Terry Gess, Vicki Gill, Tom Gray, Mark Hewitt, Meredith Heywood, Helene Icard, Tonda Jeffcoat, Fred Johnston, Carol Genthithes, Matt Jones, Jennie Lorette Keatts, Crystal King, Bruce and Janice Latham, Andrew Linton, Nancy Lovejoy, Dan Lovejoy, Mary Holmes, Michael Mahan, Eck McCanless, Milly McCanless, Fiva McCanless, Beth Gore, Karen Mickler, Lyn Morrow, Vernon Owens, Pam Owens, Ronan Kyle Peterson, Phillip Pollet, Hal and Eleanor Pugh, Joseph Sand, Caroleen Sanders, Barbara Strassberg, Tom Suomalainen, Bobbie Thomas, Doc Welty, Charlotte Wooten, Daphne Cruz Zug, Kyle Carpenter, Seo Eo, Roy Strassberg, Abe Fenberg, Susan McGehee, Levi Mahan, Ben Owen III, LoriAnn Owen, Samantha Henneke, Bruce Gholson, Daniel Johnston, Kate Waltman, John Viegland, Alex Matisse, Donna Craven, Susan Greene, Anne Raven Jorgensen, Stephanie Martin, Michael Kline, Cynthia Bringle, and Keith Lambert. Tickets are $15 per person, or $25 for a pair, and must be purchased in advance. 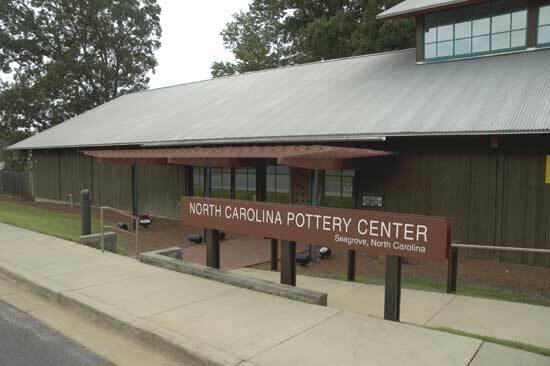 The North Carolina Pottery Center offers educational opportunities to statewide schools and individuals, changing historical and contemporary exhibitions, demonstrations, and information about statewide potters. The NCPC is a private nonprofit entity, funded primarily through memberships, grants, admissions, and appropriations. The Center is open Tuesdays – Saturdays 10am to 4pm, admission (excluding free special events): $2 – adults, $1 – students 9th through 12th grades, Free – children through 8th grade, free – NCPC members. Handicap accessible. Groups and tours welcomed. Editor’s Note: The NC Potter Center is a great place to visit if only to learn about pottery, the history of pottery in North Carolina, what kind of pottery is being made in North Carolina today as well as the Seagrove area, but beyond that, it presents important and education exhibitions of pottery – historical and contemporary. It is also a great educational facility for the region’s school students. And because offering all that takes money – lots of money – they need the public’s help to supplement the funding they receive from local, regional, state and national sources. Whether you take part in one of the fundraisers offered, you can always make a donation – on a visit, by mail or on their website. Anything you can do will make a difference. 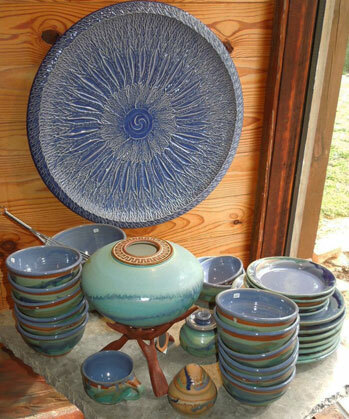 Although I have not received an official press release on this event yet, I wanted to give those interested in supporting the NC Pottery Center in Seagrove, NC, a heads up on this event. I’ve been seeing examples of some of the paintings by potters being offered on Facebook and some are surprising – not that you wouldn’t expect to see such talent from folks who produce such wonderful pots, but that they would be so skilled in other art mediums. I’m not sure I know many painters who could make more than a first grade level ashtray out of clay. 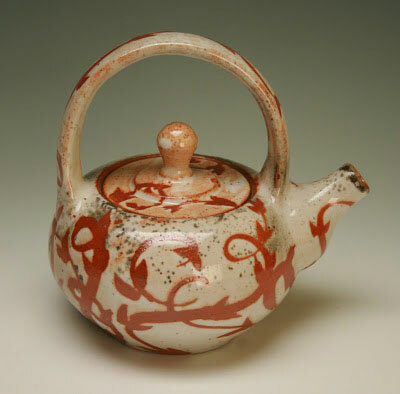 The event dubbed, The Potter’s Palette, will feature 80 paintings by some of NC’s talented potters – all 12″ x 12″, at an auction to be held on Feb. 4, 2012, at the NC Pottery Center. You won’t have an opportunity to bid on such unusual works of art – unless this fundraiser is a big hit, but then you’ll still probably have to wait another year and the participating potters will possibly be a whole different lineup. 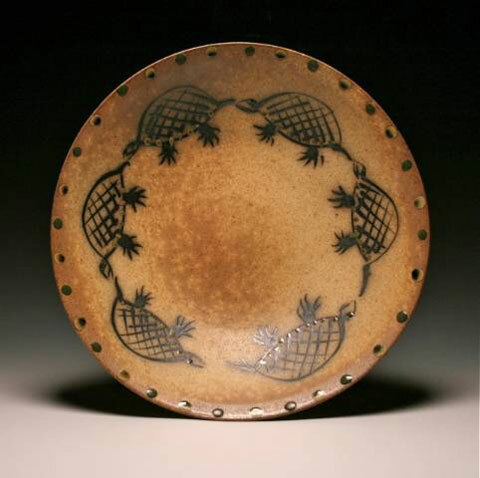 I’m offering a few images here, but you can see them all on the NC Pottery Center’s website at (www.ncpotterycenter.org). Tickets to this event are $15 or 2 for $25 and include live music, a delicious buffet of hors d’oeuvres from gourmet bites to seafood to desserts, the chance to bid in the live auction and an opportunity to purchase some complementary pieces of pottery! Purchase tickets before Jan. 31, 2012.